The Wasp WDI7500 industrial 2D barcode scanner is built for the harshest and most demanding applications in warehousing, transportation and logistics, and manufacturing industries. This 2D USB barcode scanner is a preferred scanner because of its omnidirectional reading capability which provides a scanner that is able to read any kind of 1D or 2D barcodes, regardless of the orientation. It also includes a four dot aiming system that provides quick and accurate scans to increase efficiency and ensure error free scanning. Innovative, rugged and ergonomic, the Wasp WDI7500 industrial 2D barcode scanner is designed to provide a comfortable data collection for the user and a reliable operation in the long term. It operates in a wide range of temperatures, has a water and particulate sealing rating of IP65 and maintain its reliability even when subjected to repeated drops on concrete. 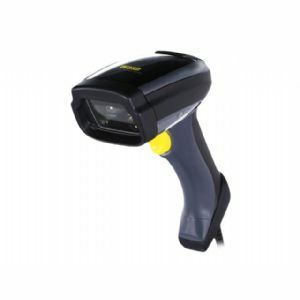 The Wasp WDI7500 industrial 2D barcode scanner incorporates advanced features to excel in the most demanding environments: "Liquid lens" that adapts and focus at different distances; this provides a versatile optic that is able to fulfill any scanning need with a single scanner. It also features 3 Green Light technology for visual good-read feedback and loud beeper for audio good-read feedback.